It might be a little bit too early to be thinking about Christmas, but I've got some Christmas craft fairs coming up so I need to think ahead. 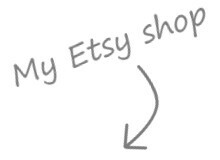 In addition to the things I make for Etsy, I've been adding to my stock with some seasonal items. This gingerbread man ornaments is made out of Sculpey - a flat base with the features added on - and then painted with acrylic. I also made some smaller gingerbread men. For these I painted on the features, using the tiniest brush, instead of making the bits with Sculpey first, as I thought that would get a bit fiddly. My first craft fair of the season is this Saturday. For anyone local reading pop down to the Letchworth Settlement between 10:00 and 4:00 for the Garden House Hospice Arts, Craft & Design Fair. 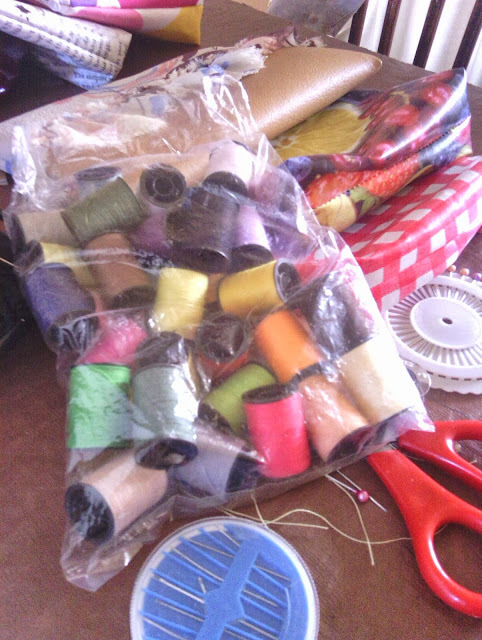 My sewing box is kind of a mess. In the bottom part there's lots of little things I made and haven't done anything with. I made a few of them at the time - and even made one into a necklace - but the others got forgotten. The tiger face is a circle of fabric sewn around a disc with a bit of stuffing. I decided to buy some hair clips from Ebay to do something with it. I made a simple bow from this black leathery fabric, which I've used here and here, and attached the tiger face to the front. Then I glued the hair clip to the back of the bow and it was done. As well as a tiger face I also had a couple of tiger print circles. I attached one to another bow that I'd started to make but didn't finish because the fabric was too thick to be a proper bow, but it worked for this hair clip. I love these simple project where I've done most of the hard work already. ...survived working 3 days in a row. 30 hours in 3 days? Nailed it. On Wednesday my sister invited me and my parents round for dinner and to watch the Great British Bake Off final. The final was aired on Tuesday evening so we all spent the day avoiding media to keep the surprise. Unfortunately the radio was on at work at it gave away the winner. 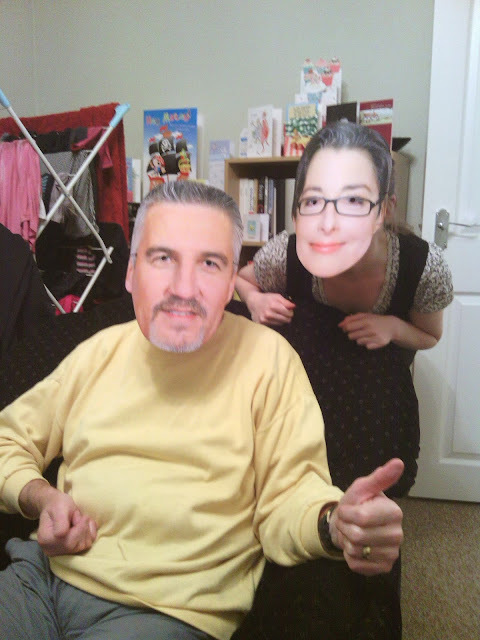 My sister surprised us with these GBBO masks. That girl cray. On Thursday I went to the private view of the New Maynard Gallery's Open Exhibition, which I have two paintings in. The private view had a great turn out, yummy nibbles, and the prizes were awarded by the Mayor of Welwyn. How was your week everyone? I'm gearing up for Christmas craft fair season so I made this little guy to add to my stock. I sold some of the animal photo holders I made last year, so I thought I would make some more. The dog is made of Sculpey and when moulding it it spends a long time looking really bad until suddenly it looks like a dog. There's a lot of doubt in that first period though. I used a pokey tool to give the fur a little texture, and painted it with acrylics. I think my favourite part is the tongue! In between working I've managed to finish this painting I showed you the start of. It's my friend Lizzi at the beach. 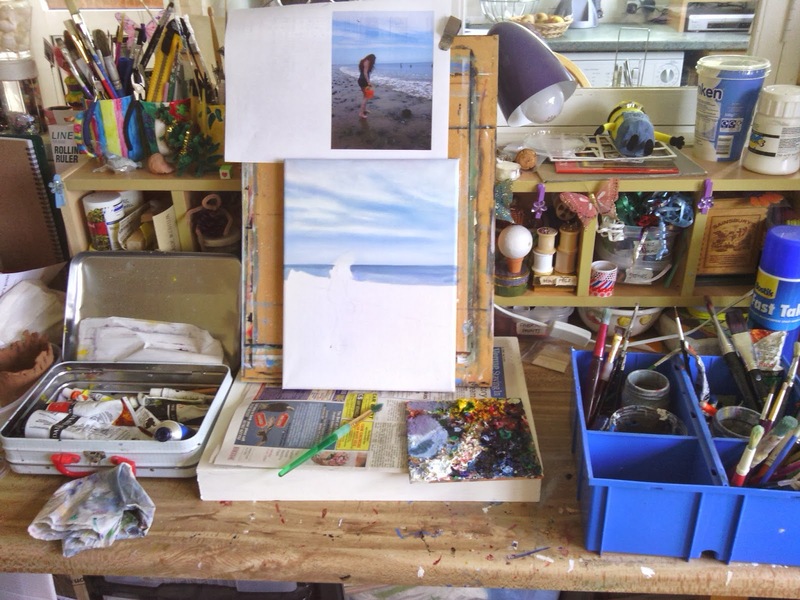 The painting is based on a photo I took when we took a trip to the beach at the end of August. Lizzi's always a good sport and doesn't mind me taking lots of photos. So there might be a few more paintings from this occasion to be made. 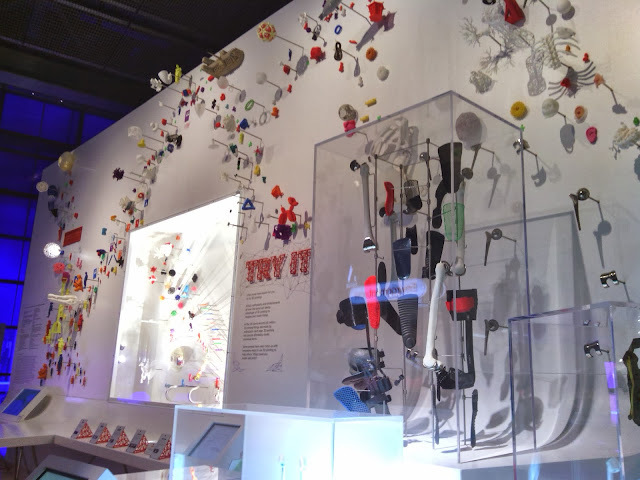 ...had a dentist appointment in London so I used the opportunity to see a special exhibition at the Science Museum on 3D printing. It showed some of the cool things that people are using 3D printers for like making mechanical hands, and organs, and little music boxes. My best friend from uni came to visit and I don't think we stopped talking the whole time she was here. 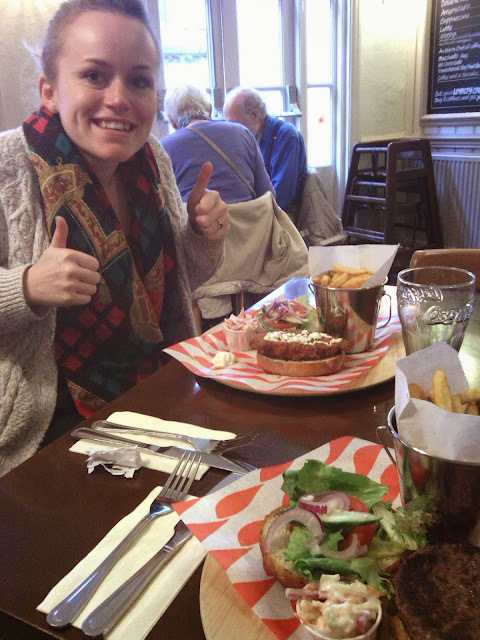 Not even while we were eating these delicious burgers. Those chips were so good guys! And I found out one of the paintings I put in the Letchworth Art Centre's Open Exhibition has been sold! As warned, I made some more make-up pouches once I'd bought some zips from Ebay. I used more plasticy fabric from the scrap store including the cool text one I used on a previous bag. All the pouches are lined with matching fabric. The black comes from the under layer of a broken dress my sister was throwing out. The spotty fabric was not from the Scrap Store. It's the excess fabric from our ironing board cover which is cool because it means it's slightly padded as there's a thin layer of sponge/foam. I repeat: nothing gets wasted. When I was at uni one of the guys on my course produced amazing double-exposure photographs and ever since his presentation about his work at the start of 3rd year I've wanted to try the technique. Check out Rob's work here. Once I'd found a film I spent over a year taking photos. I finished the film once and then put it back in the camera for a second time round. Here are some of the best photos from that roll of film. An image of my cousin overlapped with a sign on a gate. The only planning I did was to only take landscape and building type photos on the first go round of the film, and then take photos of people on the second go round. Because the whole thing took over a year (as I kept forgetting to bring the camera places) there was no way of remembering what I had taken the first time to match it with something specific. And that's the fun of it! In a lot of the photos one of the overlapped images is a bit faint and that's because I instinctively took bright photos, and of course two brights make an even brighter. So if I were to do this again I would not take so many photos of the sky! The process creates some interesting juxtapositions. The background photos were taken in Norwich while I was at uni and at home, and the people include my family, my friends from home, from uni and from camp. So it's interesting when a friend from home ends up with a Norwich background even if they've never been there. The opposite happened with this photo which has a faint image of my sister over lapped with a scenic view of the town she lives in, which happened completely by coincidence. The next time I do this I'd also like to experiment with textures as the background image, not just landscapes or buildings, but still with people being the over lapping image. Of course this type of image could be created on Photoshop but the image choices would be too deliberate. Kicking it old school with a roll of film is much more fun. And developing the film was only £4 at Tescos which isn't too bad these days. ...used my two days off to do a painting. I picked a beach photo because, you know, that's my thing. On Thursday after work I went to the private view of the Letchworth Art Centre's Open Exhibition as I have two paintings in it; this one and this one. My Dad also put two of his photographs in the exhibition. He wouldn't pose next to his pieces so this is the best photo I got. 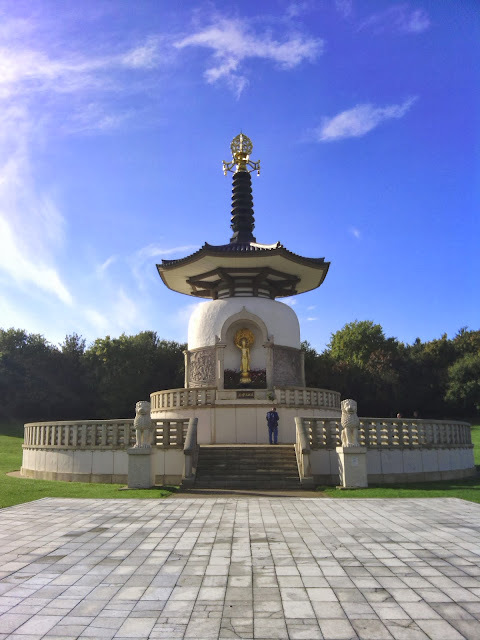 And on Sunday we had a little camp reunion in Milton Keynes and we went on a walk past this fancy pagoda and thankfully the rain stopped and the sun came out. This is what happens when you take a hand-me-down skirt and a pattern from the 90s. This project began with this copy of Essentials magazine from 1993. My Mum has a box of dress patterns and I came across this magazine when looking for a pattern for a shirt. Instead I found patterns for a summer wardrobe! I decided I wanted to make this 'sun top' but make it part of a dress. 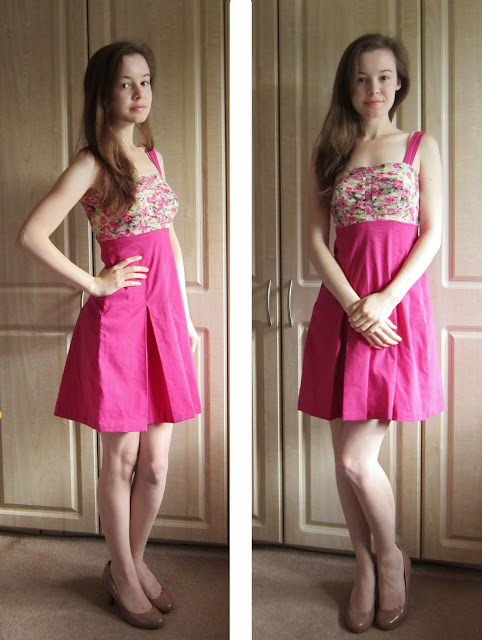 I used a skirt my sister had given me but I'd never worn and made the sun top to attach to it. I made a few adjustments to the pattern like I made it back opening instead of front opening so it would line up with the zip in the back of the skirt. I bought some buttons to match the fabric and my Mum stitched the buttons holes for me. She was a big help with this project as I haven't worked with a paper pattern before and the instructions in the magazine were a bit confusing. I hemmed the skirt and made straps from the material I cut off. I'm still not sure about the pleats in the skirt - which is why I never wore it in the first place - but other than that I really like this summer dress. Except I'm going to have to pair it with tights and a cardigan if I want to wear it any time soon. Since I'm on a bag making roll I came up with this clutch purse. I made it the same way I made the make-up pouches, except I didn't flatten the corners. The materials I used were some tan coloured vinyl material, from the Scrap Store, and the bottom frill off this dress my friend donated to my craft supplies. I was very impressed with myself that I managed to line up the frill along the seam. 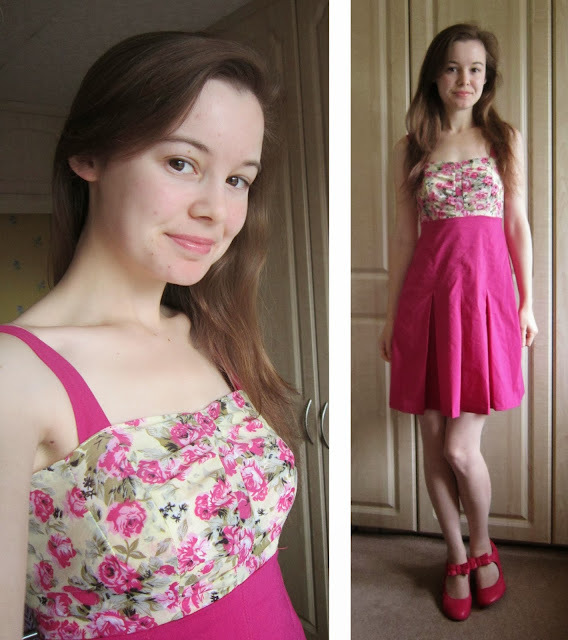 I finished it off by sewing a little zipper tag with a scrap of the tan fabric. And in the background are the mini apple crumbles my Mum made. I've been doing a lot of sewing this week so it was a good job I scored this bag of various cottons at a jumble sale on Saturday. The whole bag for 50p! Love jumbles. 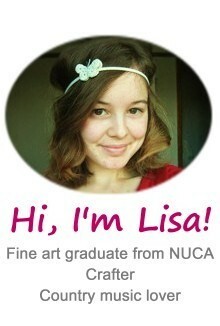 I also started a new job this week, but I don't have a photo for that. I'm a 'beverage assistant' at a local care home, which is actually just a lot of washing up. I work 10 hours a day, 3 days a week. Which means I still have lots of time for my art and my craft. Yay! We still have an abundance of over-ripe bananas so as well as the muffins, we now have flapjacks. I used this simple recipe from Netmums which is just oats, bananas, brown sugar, syrup, butter and raisins. In a recipe I've used before it said to soak the raisins (I also added sultanas) in boiling water first, which I did this time. I makes them a bit juicier. My family concluded that this recipe could have done with an extra flavour. They don't taste bad, they could just do with a little something something. 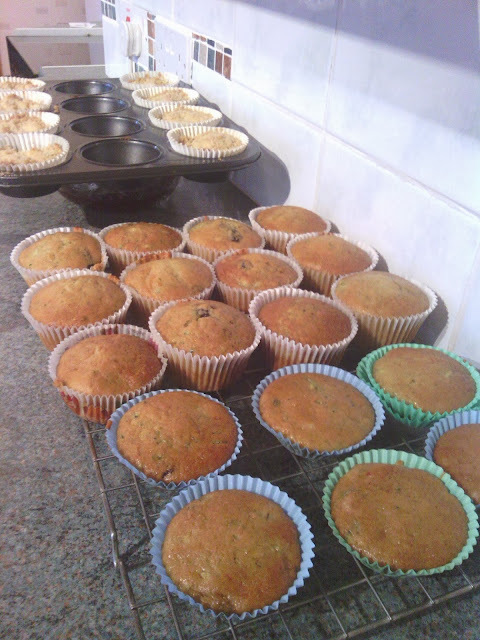 If I'd have had my head in the game I would have added some mixed spice like I did with the banana muffins. But I didn't have my head in the game. Because Steel Magnolias was on tv. And because there's fruit in them you can totally have two pieces at once and not feel bad about it.